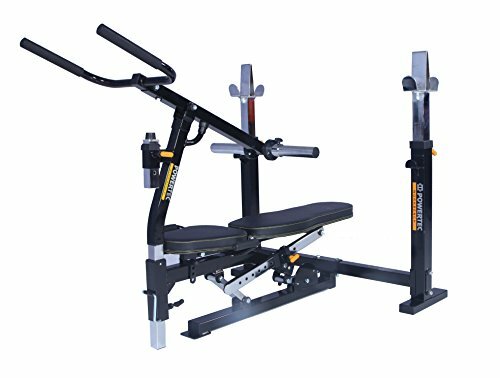 KEY FEATURES Dual bar catch access The upright adjustable bar catches on the Olympic Bench offer two-sided bar catch capability to utilize the back of the rack section for power exercises such as Squats. Optional Short Cross Bar for Narrow Bench (WB-OB15-SBC) For reduced foot print and additional exercises. Improved safety Stopper added for your protection during exercise. Powertec Bench Linkage System All Workbench benches incorporate the Powertec linkage mechanism that allows for the bench section to pivot from the front to the rear locked position with ease for the purpose of the shoulder press exercise and to provide front stability support for all Workbench Machine Accessories. In addition the rear position is used to save space when not in use. Build Your Workbench Accessories An access tube and knob lock pin has been incorporated into the Olympic Bench providing the new "Workbench Machine Accessories" to be added.